I have thought of titling a post in this way for quite a while. Tapas? Sorry, not the eating kind, but a selection of smaller tidbits from my wanderings so far, rather than a post on one theme. I am staying on a farm. I am writing this from the balcony of my room (it’s bigger than the very comfortable room), the daily late afternoon breeze cooling the heat of a degree sunny day. I am looking out on vineyards and olive groves, with hills in the distance. Here’s the house (I’m on the middle balcony). A wonderful young couple run the farm and the bed and breakfast, Mónica and Ferran, with their 6 year old son, Ivan (pronounced with a b sound). 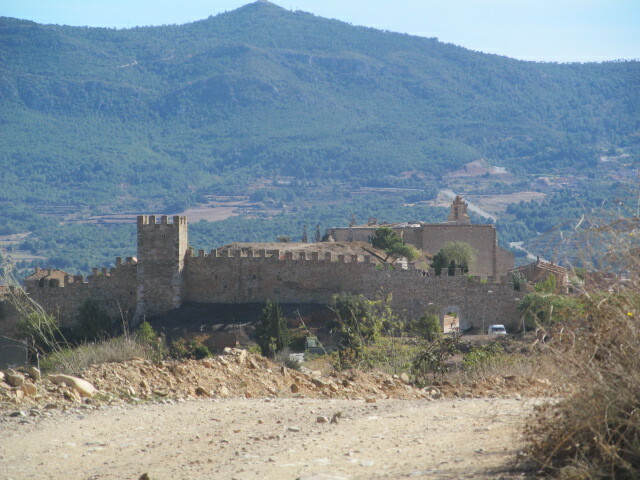 It’s a 10 minute walk down a dusty land to a walled village, Montblanc, walled with 30 some tours. It is easy to get lost in the labyrinth of narrow streets, interesting shops and bar/restaurants. 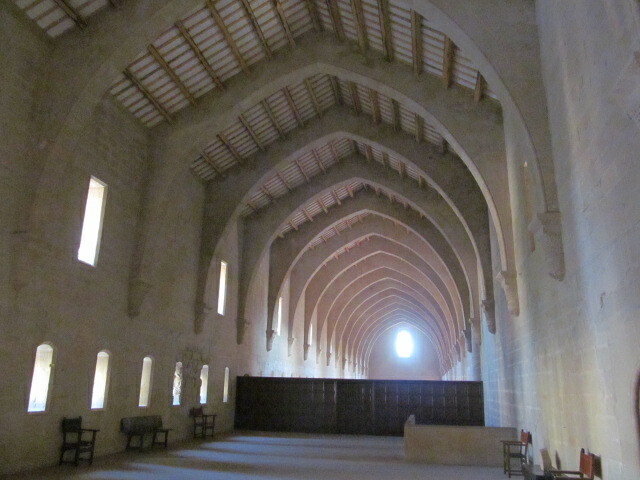 Within a few miles is one of the great monasteries of Spain, Poblet, begun in the 12th century by French Cistercian monks who put the emphasis back on the simplicity and austerity in the Benedictine Rule, and on developing the local rural economy. 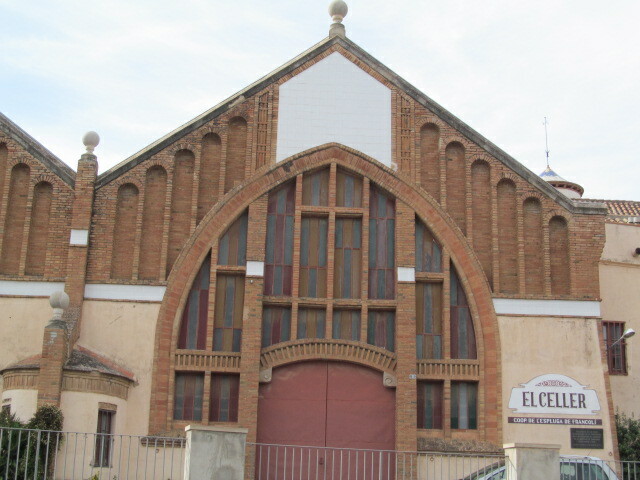 This is the hall, 180 metres long, where the monks slept in past centuries. Amazing simplicity of design, very powerful. I have mentioned to friends my impression of the Spanish as a people with a strong sense of the visual, of design. 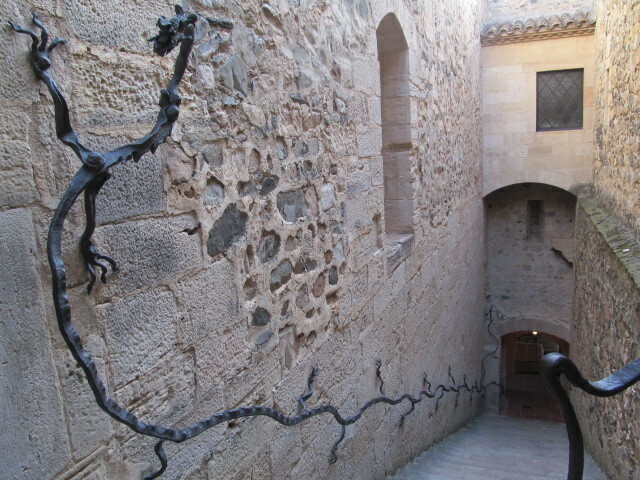 In a corner of the monastery, a corner that was restored, a young artist influenced by Gaudi and modernismo in design, was hired to fashion a handrail. This is the amazing result. Every day I see examples like this that leave me totally charmed by this culture, by this people. 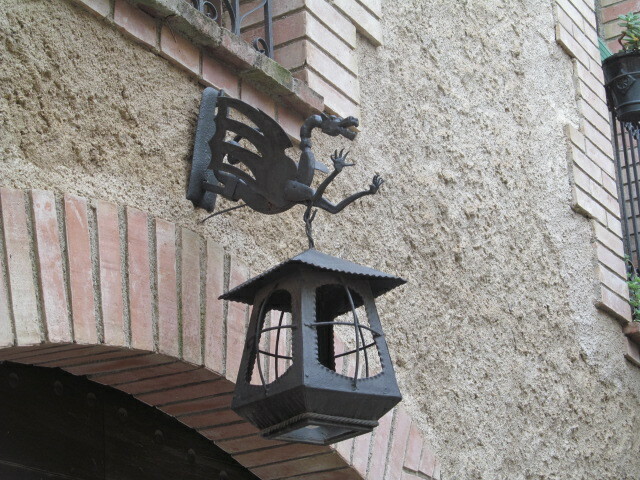 Here is a lamp holder over the doorway of a house in a tiny village high in the hills. 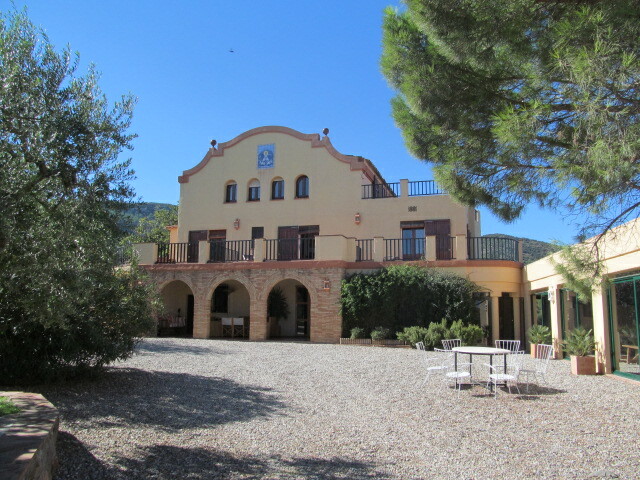 Near Montblanc is a second great Cistercian house from the 12th century, Santa Creus. They do museums and galleries well in this country and today I was treated to the finest introduction that I have ever been privileged to enjoy. It began as an audiovisual presentation, a voice talking about the world in which he lived, of violence and inane pursuits, motivating him to retire to an isolated monastery to pursue his form of perfection. Then the screen disappeared and we were looking at an actual scaffolded wall, with the stones and tools that would have been used to build the monastery by the monks themselves, with a soundtrack of the noises of construction; another curtain opened and before us as the sun filtered through a door was a typical medieval monastic room, with evidence of the daily life of work and prayer, the sacks of grain, the wine press, the table set from the meals in silence, etc. 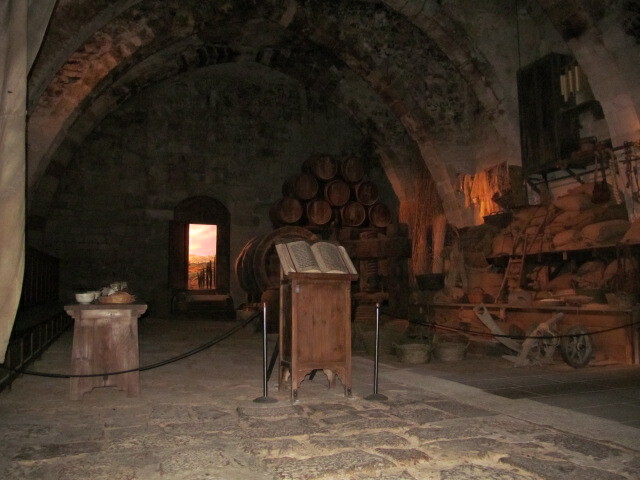 A door opened and we were then invited into the original scriptorium; the narration continued with slides showing manuscript pages on the wall. 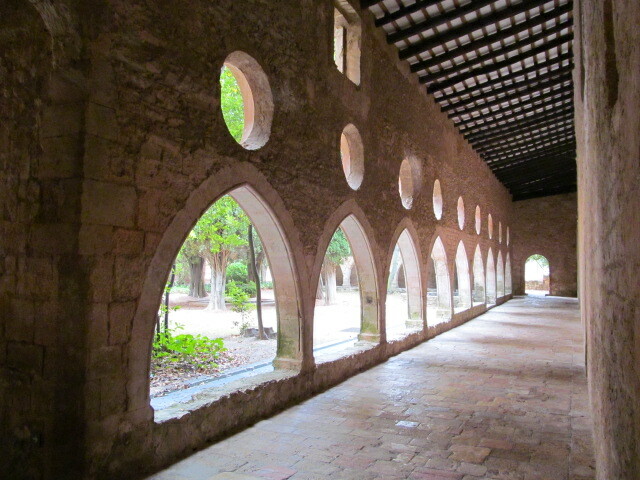 A final door opened and we were in the actual cloister, Santa Creus’ second one. Very impressive. I am remembering the audiovisual presentation at Ste Marie among the Hurons in Midland, the film ends, the screen rises and we walk out into the reconstructed village. A capital in the larger cloister. 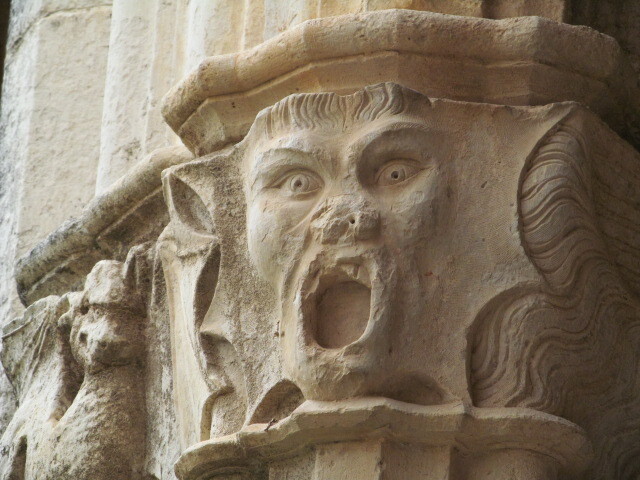 I love romanesque capitals and corbels (under the eaves) – so much fun, at times religious, at times expressions of the life of the village, at times clearly pagan. Here I am trying to capture a sense of the soaring height and simplicity of the central nave of the church. Now for a change of taste. I am in wine country, one of many in Spain, the home of cava, the Spanish champagne. In the early twentieth century, a regional government agency set up co-operatives to help the individual farmer to prosper. 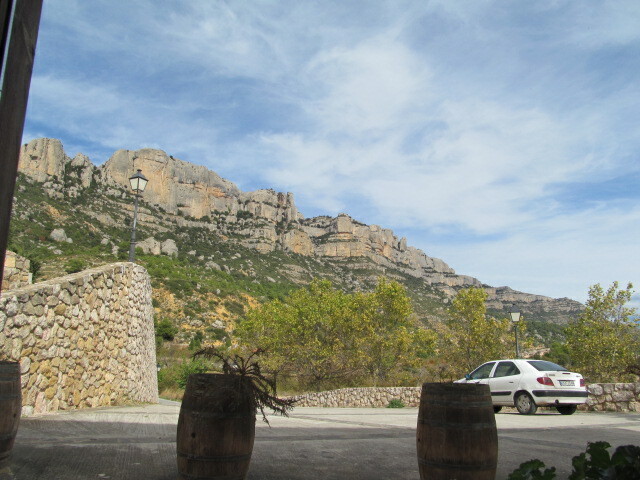 These are still at the heart of the wine industry in Catalonia. My farm hosts market their wine through the local co-operative. And these government offices hired interesting architects, those working in the style referred to as modernismo, to lend value and prestige to the undertakings particularly as this was a new kind of venture. This is the co-op building in a town close to Montblanc. 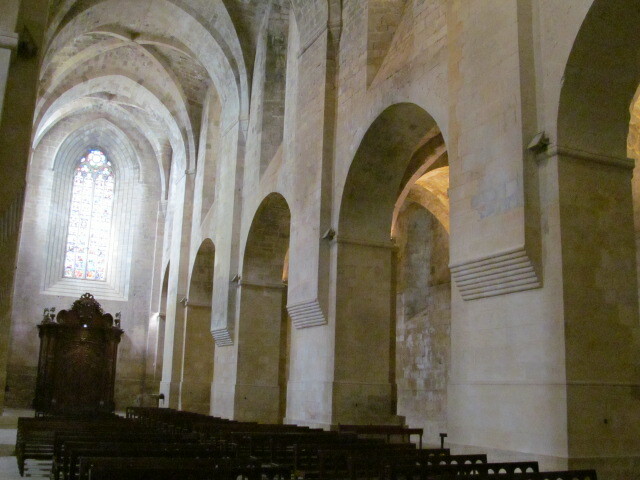 I toured a museum in the building and the interior great room with its enormous vats of fermenting juice, with its interior roof arches reflecting the exterior design, is as impressive as any romanesque church. And, I didn’t take my camera into the museum. The use of brick comes down from the Romans through the Moors and such a building is clearly in the mudejar tradition, about which you will hear more in the next post. I can’t title this ‘tapas’ without at least one food photo. 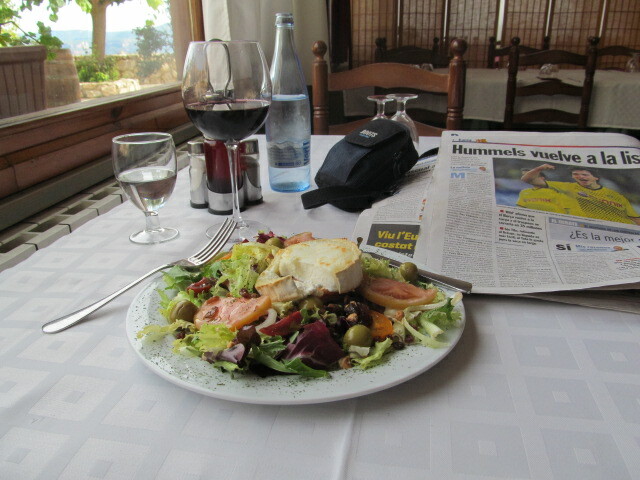 This a a warm goat cheese salad, the first course in yesterday lunch high up in the hills. It is easy to notice the glass of tinto; only those in the know will pick out the Barcelona football daily, a must read while I am in Spain. And what’s outside the window? A flat topped mountain which must stretch for 10-15 kilometres and which dominates that landscape for as far as the eye can see. This entry was posted in Uncategorized on October 18, 2013 by agnotarte. The endless varieties of arches are interesting too! And was that a whole goat cheese ’round’ they topped your lunch with? Yum yum! A very satisfying tapas, Eduardo! And completely non-fattening from our vantage point. Very interesting architecture – much of it looks very modern in style – minimal perhaps is what I mean. Te voilà de retour en Espagne! Tu es chanceux! Toutes ces beautés que tu vois doivent rendre ton séjour agréable ! Tes photos sont superbes et donnent le goût d’aller te retrouver 🙂 Tu vas finir par t’installer à demeure en Espagne!! Profite bien de ton séjour!